Why should you worry about your windows? The windows of your facility may be one of the first things customers and employees notice, but you may have become immune to the spots and debris on them. Keeping them clean ensures that you present a professional image at all times. In addition, regular cleaning can extend the life of the window. Grit and grime left on the window can etch the surface of the glass, which makes it less attractive. This etching can also impact the stability of the glass, making it more prone to chips and cracks. Having your windows washed professionally on a regular basis can remove this grime while also restoring the glass if damage has already occurred. Commercial window cleaning services have the right tools to reach all of your windows (even those out-of-reach windows) safely. A window cleaning company has the right tools to clean the windows efficiently, without leaving spots and smudges. This may include ladders, squeegees, cleaning rags, specific cleaning solutions and other tools. Professional cleaning services handle window cleaning on a daily basis, which makes the job go much faster and improves the safety of your facility while the windows are being cleaned. Hiring professionals will save you time. This allows you to focus on other areas of the facility to ensure full maintenance, rather than dedicating yourself or an employee to the task of window washing exclusively. Professional window washers know the right cleaning supplies to use. This is more important than you might think, as using the wrong type of cleaner on your glass can actually damage it. For instance, ammonia-based cleaners on leaded or stained glass can cause the glass to cloud, and that damage cannot be repaired. Hiring a professional saves you frustration, because you can be certain the job will be done right the first time, rather than having to redo the job over and over to remove all streaks and spots. Professionals can also deal with insect infestations that are common on windows and window areas. Finally, professionals can spot problems with the windows that could lead to expensive maintenance needs, before the deeper problem has a chance to develop. Hiring professionals for window cleaning in Washington DC will save you time, money and frustration. Don’t neglect this important task, but leave it to the professionals to reduce the hassle. How often should you have your windows cleaned? The answer depends on a number of factors: If your windows are in high-traffic areas or within reach of small children, you may want to schedule a weekly cleaning to remove those surface fingerprints. If your windows are out of reach and you don’t have a dust problem, two times per year may be sufficient. Consider the amount of dirt exposure and the location of the windows, and choose a time that will work well for your facility. First, ask the company about the supplies it has. Your window washers should not only have the cleaning products for a number of glass types, but also the ladders and other equipment necessary to safely access all windows, and apply the products it uses — thoroughly removing all equipment after the job is complete. Also, look for a company with a solid reputation in the Washington DC metro area. The Better Business Bureau rating system is a great place to look for this information. A company with a strong rating on the BBB is one you can trust to do a superior job with your windows. Finally, look for a company that carries proper licensing and insurance. This provides protection for your company should an accident occur, and also shows that the company has the right skills and equipment to do the job safely. 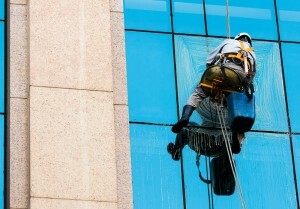 If you are looking for commercial window cleaning in DC, trust the seasoned professionals at Premiere Works. With our help, you can have sparkling, well-maintained windows all year, enabling you to focus on more important aspects of your business. Contact us today for an estimate.